Peggy with her Olympic gold medal won in Grenoble, France, 1968. I love this shot of her! Since the figure skating events at the Sochi Olympics are underway this week and next, I can’t help but think of skating dresses I have loved on ladies’ singles competitors in past Olympics. It is a very short list. 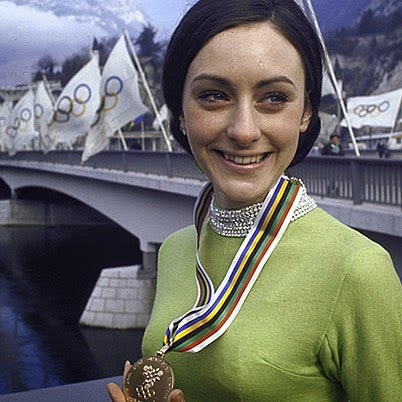 Peggy Fleming in Grenoble, France, 1968, in her Olympic dress. Two dresses which I find iconic and emblematic of simpler times in the sport of figure skating were the green dress worn by Peggy Fleming when she won her gold medal in 1968 in Grenoble, France (I wasn’t born then but I have always loved pictures of Peggy from that time), and Dorothy Hamill’s red dress which she wore when she won her gold medal in Innsbruck, Austria in 1976. Note how they are nearly identical in style, with jeweled neckline and sleeve cuffs, in solid colors, with no other embellishment. 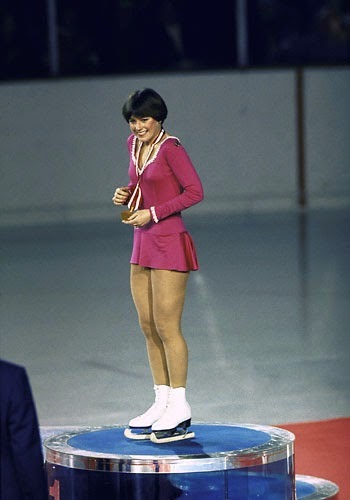 Dorothy Hamill in Innsbruck, Austria, with her 1976 Olympic gold medal. Adorable! 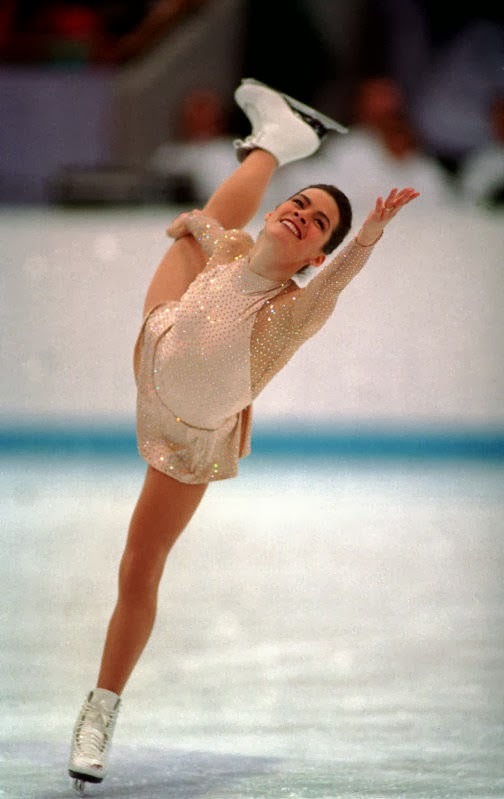 The only other skater whose Olympic dresses I loved was Nancy Kerrigan. I thought this neon yellow dress she wore during her short program at the 1992 Olympic games in Albertville, France was terrific. She won a bronze medal that year. Nancy in her short program at the 1992 Olympics. Photo by Rick Stewart. At the 1994 Winter Olympics in Lillehammer, Norway, I adored the black and white dress she wore for the short program, with its black velvet bands at the bodice, sheer sleeves which ended in a beaded cuff, and the open back. Elegant and gorgeous! Nancy at the 1994 Olympics in Lillehammer. Photo by Getty Images. I love the black and white, sheer sleeves, and the open back. Photo source. And that stunning champagne-colored dress she wore for her long program is the most gorgeous skating costume I have ever seen. It sparkled from every angle and was glorious. I remember being blown away when Nancy took to the ice for her freeskate wearing that dress. I still love it, twenty years later! I agree with EVERYTHING you said in this post!!! Thank you for the glorious photos and content. I love all the costumes you mentioned, and could talk for HOURS. About them all --as well as wardrobe malfuntions with the dancing pairs--. I agree with Paula! Last night, the woman on the American ice dancing team looked like she had a serious wedgie going on. I loved that neon pink Pink Panther number and the red and gray outfit was so gorgeous. It's my favorite so far. My husband's 2nd (or 3rd) cousin (Courtney Hicks) is an ice skater and was close to qualifying for the Olympics this year but sadly didn't. I bet she could tell some interesting stories about choosing costumes, wardrobe malfunctions and the like! Hi Adrienne! Yeah, I hear you, it annoys me to no end when I see these gals with half their bottom coming out of their skirts. It makes me crazy in fact, because I know they could ask a dressmaker to fix this problem. I hope that they lose points for this, there is no excuse for this to happen, you know they must have a million run-throughs with the music and costumes! I really like Kerrigan's B & W one...the older ones are the best! oh I agree with Coulda Woulda Shoulda, I would add Katarina Witt to the mix for costumes, hers were definitely memorable. Nancy K's dresses were lovely too, everyone else would have looked absolutely garish in the 1992 green dress but she looked magnificent.